Sour Cream Cheesecake is one of my all-time favorite desserts! 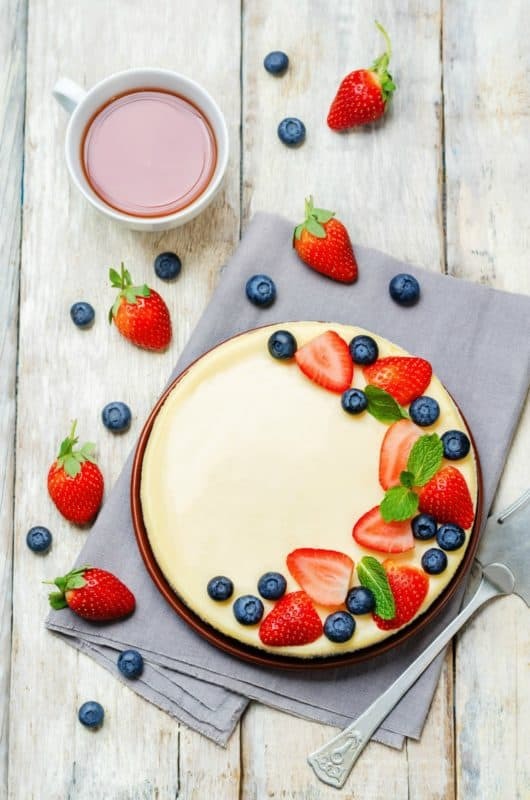 I love it topped with fruit – especially strawberries and blueberries. After all, what can beat the smooth creaminess of Sour Cream Cheesecake? Add a cup of coffee and it’s a win-win. Now, if you have the idea that a cheesecake takes a special talent to make – think again! 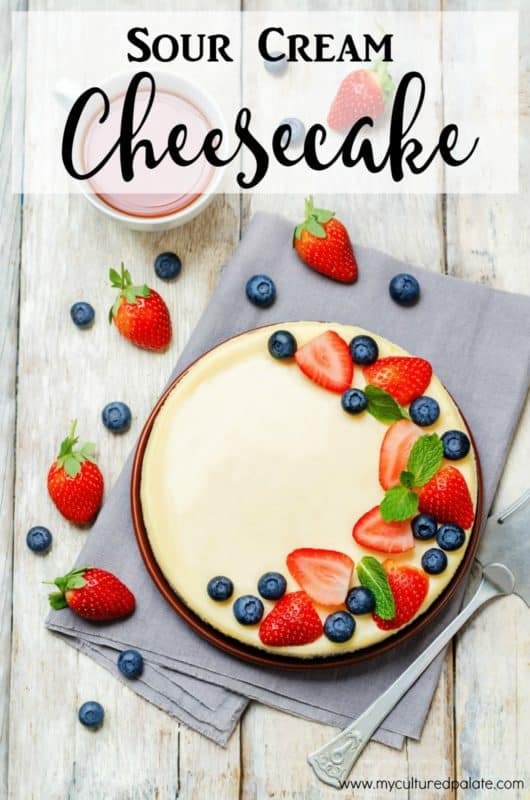 This Sour Cream Cheesecake recipe is super easy – even a beginner cook can make it successfully! I like to jog on my mini-trampoline while watching a show on Netflix – it helps pass the time and I forget I am exercising! Well, I finished all the Hawaii 5-0 episodes I could find, and so started looking for something else. That’s when I discovered The Great British Baking Show. If you are not familiar with it, let me share a bit about it. The season starts with 13 bakers in a weekly competition. One is dismissed at the end of each week. It’s such a positive show, unlike a lot of super-competitive American cooking shows. It and The Great British Bake-Off are full of so many nice chefs! In the final episode of the season, three bakers remained. Throughout the season, each weekly competition consists of three challenges – a signature bake, a technical challenge and a show stopper. Guidelines are given for each challenge – flavors and ingredients to be used. But, it is up to each baker as to how to do the baking itself. One thing I have learned from watching the show is that having the right tools is important to the final presentation. You wouldn’t make pie crust without fully iced water, would you? A spring-form pan makes all the difference in a cheesecake! 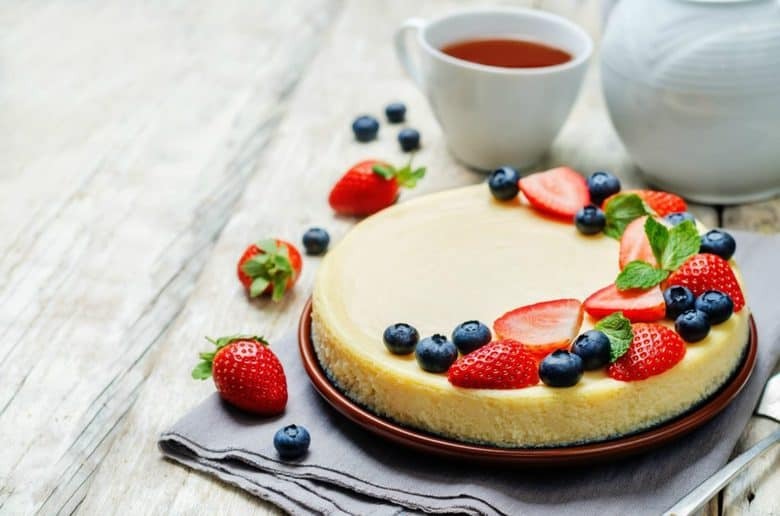 If made in a traditional pan, the crust of a cheesecake sticks and is difficult to remove. So, the final appearance is lacking! I am aiming for a Show Stopper type of look here! A spring-form pan lends a cheesecake the structure it needs without confining it to a pan that may hinder the baking process. It lends it a structure that keeps the cheesecake light and fluffy but still… you know…. not falling apart. It’s, of course, essential to keep the cheesecake together! The ingredients need time and structure to bind together in the fridge. You don’t want all that cream cheese sliding around! Wondering what the rest of the family thinks about this dessert, especially since there are so many boys in my family? Let me put it this way: I normally make two cheesecakes at a time and they were both eaten completely – in one sitting! That says it all – this recipe is a definite winner! It might just become a regular staple around these parts (in moderation, of course!). 1 Tbsp vanilla. I buy my real salt, herbs and spices from my affiliate, Starwest Botanicals - many of their herbs & spices are organic, and I think they are more aromatic and full flavored than any others. Grind cookies fine in a blender. You can also put them in a ziplock bag and roll them with a rolling pin. Press into the bottom of a 9" spring-form pan. Refrigerate while preparing the filling. Beat cream cheese until smooth with hand mixer. Add the sugar and sour cream and mix well. Add the eggs and vanilla - mix until smooth. Pour into the pan and smooth the top. Bake at 350F for 30 - 40 mins. Turn oven off and leave in oven 1 hour to set. Remove and chill in frig. until firm - about 3 -4 hours.